It goes without saying that Hyundai has come light years in terms of quality and desirability over the last two decades. The last generation Elantra was a great car – far above anything the company had ever built in the compact segment. It was the last Elantra that won the automaker more respect as a company. It also garnered far more sales than ever before. But now there’s a new Elantra in town. The 2017 Elantra, now in its sixth generation, takes everything we liked about the fifth gen and boosts it to 11. The new design is cleaner and more elegant, the interior is more conventional and mirrors the inviting cabin of the larger Hyundai Sonata, and its two powertrain choices are all new with respectable fuel economy. One thing hasn’t changed though, and that’s the Elantra’s value proposition. It’s a lot of car for the money, coming with features normally reserved for higher end vehicles. Radar cruise control? Yep, it’s available. LED exterior lighting? Yep, that comes standard. Leather seating? You guessed it – it comes standard with the Limited trim. My up-optioned tester carried a sticker of $27,710. That’s impressive. So how does this rolling value behave as an everyday driver? Pretty good, not surprisingly. Keep reading for the full run-down and details on my week with the 2017 Hyundai Elantra Limited. Continue reading for the full driven review. The Elantra’s shape for 2017 is completely new, but it still recalls the fifth generation’s presence. 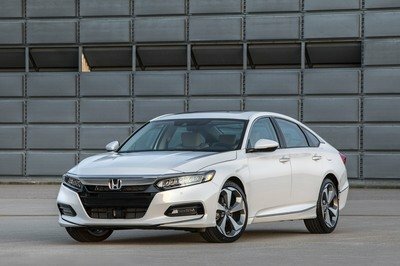 The new shape does the car full justice, making it seem very upscale and more sophisticated than a compact sedan usually is. The front grille is large with a distinct shape and horizontal slats. The grille bleeds off into the front bumper well, sending angled shapes and character lines into the vertical LED daytime running lights and optional HID projection beam headlights. A close eye will spot the radar cruise control’s sensor placed low in the grille. The car won’t stand out in a parking lot full of BMWs or Mercedes', but it will look rather stately parked in the average American’s driveway. Around the sides, twin character lines run rearward from the front fenders, shooting above the door handle and just above the rocker panel. 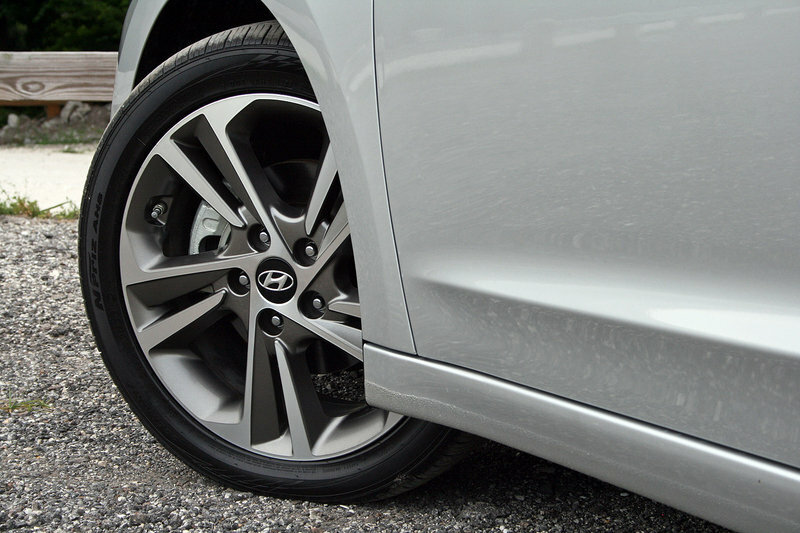 It’s a subtle enhancement, but it’s one that lends a handsome look to the Elantra’s profile. The 17-inch alloy wheels further add to the car’s charm. The gray-painted pockets help offset the polished alloy fronts, giving the wheels a very 3D look. 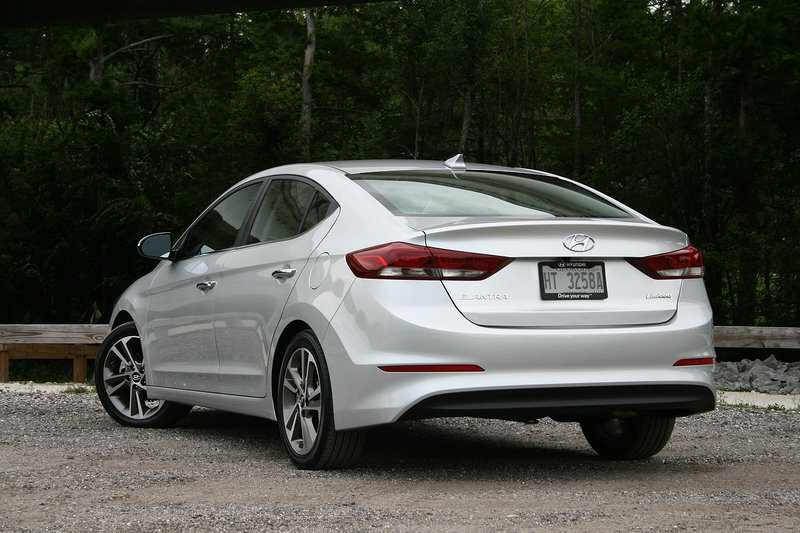 Out back, the Elantra really takes after its big brother, the Sonata. The trunk lid features a relatively large spoiler to aid in aerodynamics and appearances. The lower bumper fascia terminated the character lines well. The taillights help add attraction with their three-eye pods. The taillights are all LEDs, so you won’t be replacing burnt taillight bulbs for several decades. In total, the Elantra’s new looks are handsome and well received. The car won’t stand out in a parking lot full of BMWs or Mercedes’, but it will look rather stately parked in the average American’s driveway. Like the exterior, the Elantra’s interior is a scaled down version of the Sonata. Of course, that’s not a bad thing as the Sonata’s interior is a welcoming place to spend time. 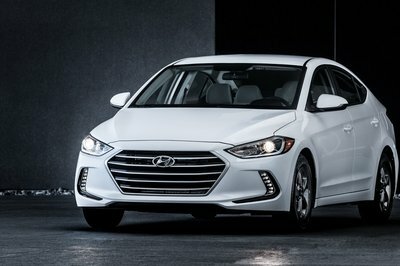 What’s more, the resemblance helps connect the Elantra and Sonata to the Hyundai brand. Brand recognition helps generate brand loyalty – something Hyundai is still working on. Once inside, the driver is greeted with a three-spoke steering wheel that features controls for the radio, phone, and cruise control functions. The gauge cluster is simple yet elegant with two main analog gauges and two smaller gauges for coolant temperature and fuel level. A driver information screen is centered in the cluster, giving info on everything from tire pressure to fuel economy averages. As a whole, the dash is handsomely trimmed with satin chrome trim and piano black plastic. 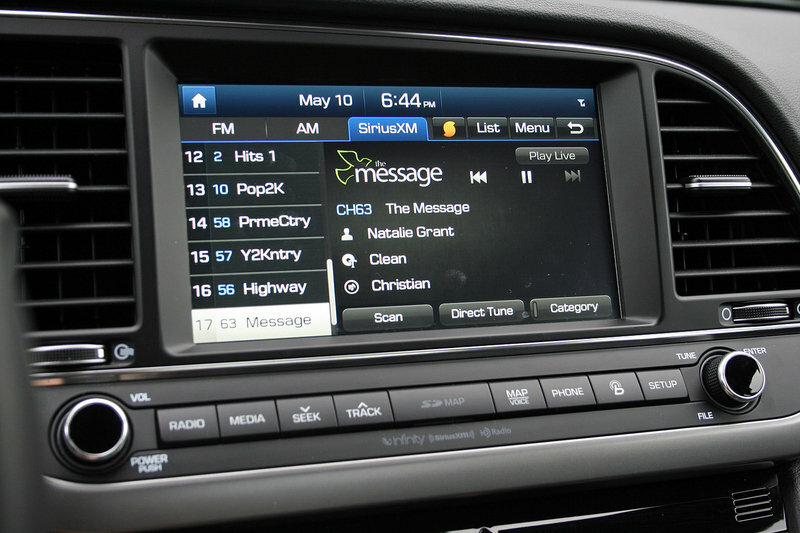 The main attraction in the center stack is Hyundai’s eight-inch infotainment screen. It offers intuitive software with a simple user interface. Radio presets are easy to set and recall, the navigation system is relatively simple to program, and menu settings are easy to change. Apple CarPlay and Android Auto are offered. Projecting your phone is simple thanks to the USB connection port ahead of the gearshifter. Beside the USB port is an AUX input port and two 12-volt power plugs. A spring-loaded door keeps the plugs out of sight when not in use. The center console area continues the clean lines of the dashboard. Buttons for the heated front seats are easily accessible, as is the drive mode select button. Two large cup holders are parked beside the manual parking brake handle. A padded center armrest raises to reveal the typical console storage compartment. As a whole, the dash is handsomely trimmed with satin chrome trim and piano black plastic. The radio and HVAC controls are outstandingly simple to operate and require little attention when operating on the go. 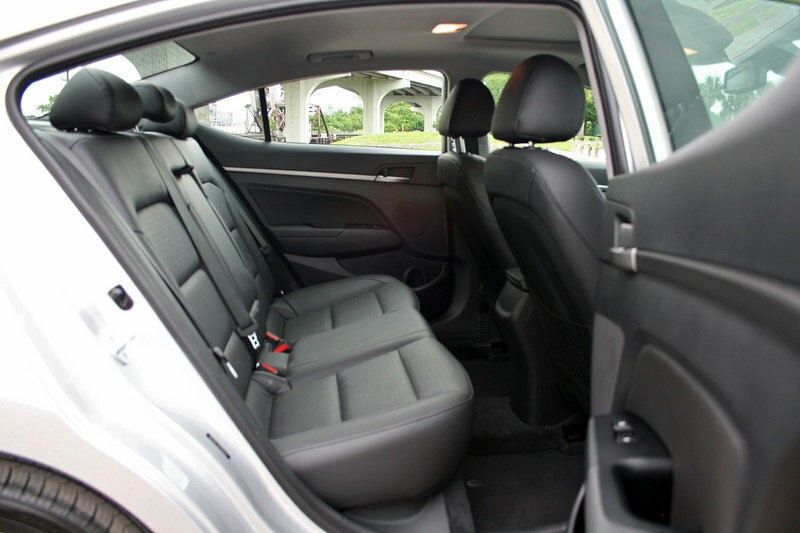 Rear seat passengers under six feet will find accommodations rather roomy for a compact sedan. A folding center armrest makes getting comfortable easy. Outboard passengers even have heated seats as part of the optional Tech Package. Trunk room is also respectable for this size car, offering enough room for a week’s worth of luggage. The rear seatbacks also fold flat for hauling longer items. There are a few issues with the interior, however. 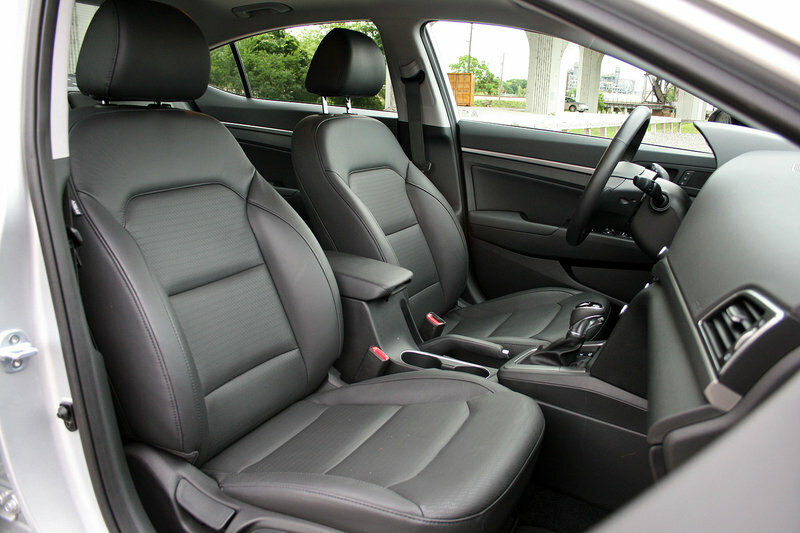 The leather seating material isn’t the highest quality and tends to get rather hot in the summer sun. It also like sticking to bare legs. Rear seat passengers don’t have HVAC vents or USB ports. My tester also had an issue with the leather coming unattached in the crook of the folding rear armrest. I couldn’t get it to snap back into place and it looked terrible when the armrest was in use. Lastly, the trunk hinges are exposed, making it easy to crush cargo or luggage. Nevertheless, the Elantra Limited fitted with with the Tech Package offers plenty of surprising gadgets and features not normally associated with a sub-$30,000 compact sedan. For that, I’m impressed. The Elantra comes in two forms: the standard 2.0-liter four-cylinder or the Eco model with its 1.4-liter four-cylinder. My tester skipped the Eco option, making the 2.0-liter four the standard engine. The larger engine runs an Atkinson combustion cycle while making 147 horsepower and 132 pound-feet of torque. That’s not overly powerful, but it gets the job done rather well. The engine comes mated to a six-speed automatic transmission. The EPA rates the 2.0-liter Elantra at 29 mpg in the city, 38 mpg on the highway, and 33 mpg combined. 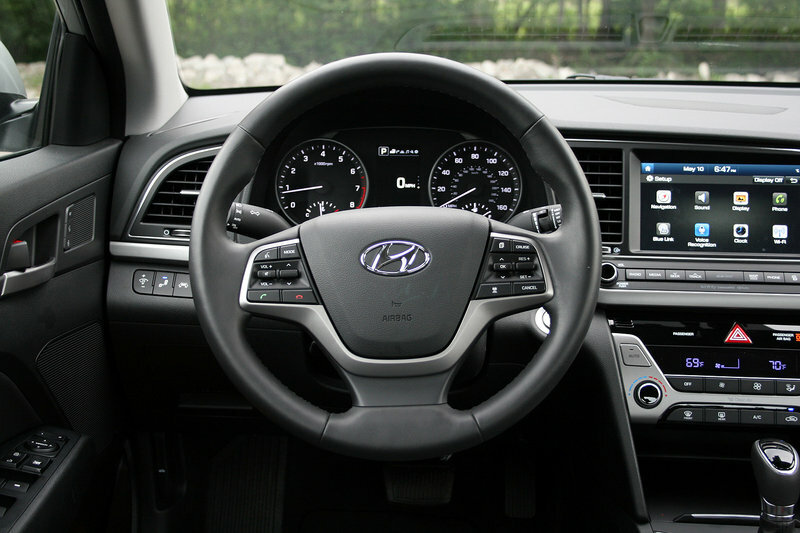 Helping the driver get the most from the engine, Hyundai includes three drive modes. Normal mode is, well… normal – helping the car get good fuel economy while offering enough power to manage traffic. Eco mode helps boost fuel economy through a less responsive throttle. Sport mode kicks things up a bit with quicker shift times and longer gear holds. Sport mode honestly changes the demeanor of the driving experience. It does not, however, change steering or handling. This isn’t a sports car, after all. The EPA rates the 2.0-liter Elantra at 29 mpg in the city, 38 mpg on the highway, and 33 mpg combined. That’s pretty impressive for a non-hybrid car with a medium-displacement four cylinder that doesn’t have forced induction. Along with a new body style, the Elantra comes with an all-new substructure and unibody construction. This makes the car more rigid, helping it feel more luxurious while giving it a stronger backbone. Hyundai says the area between the cowl and dash have been reinforced, the load paths between the front fenders and A-pillars have been straightened, and the B-pillar area is stronger thanks to hot-stamped steel. All this helps lead to better survivability in the event of a crash. There’s plenty of electronics available to help avoid a crash altogether. As a part of the Tech Package, the Elantra can have Automatic Emergency Braking with Pedestrian Detection, Smart Cruise Control, Lane Keep Assist, and Blind Spot Detection with Rear Cross-Traffic Alert. The HID headlights are also active, following the steering wheel inputs to illuminate into turns. Unfortunately, the IIHS and NHTSA crash test results aren’t available as of this writing, so official scores can’t be taken into account. Expect both agencies to test the 2017 Elantra within the coming months. Perhaps the best aspect of the 2017 Elantra is its price. My nearly fully optioned Elantra Limited tops out well shy of the $30,000 mark. 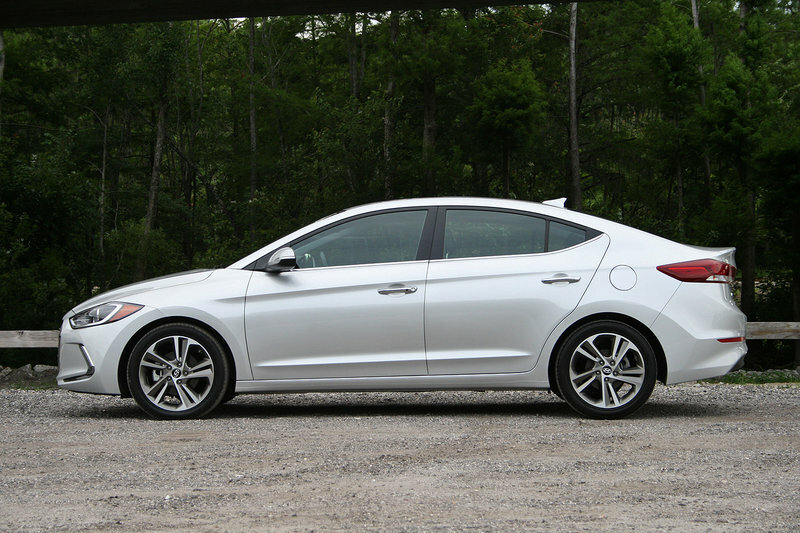 Opt for a moderately equipped Elantra, and the price drops well into the lower $20,000 range. 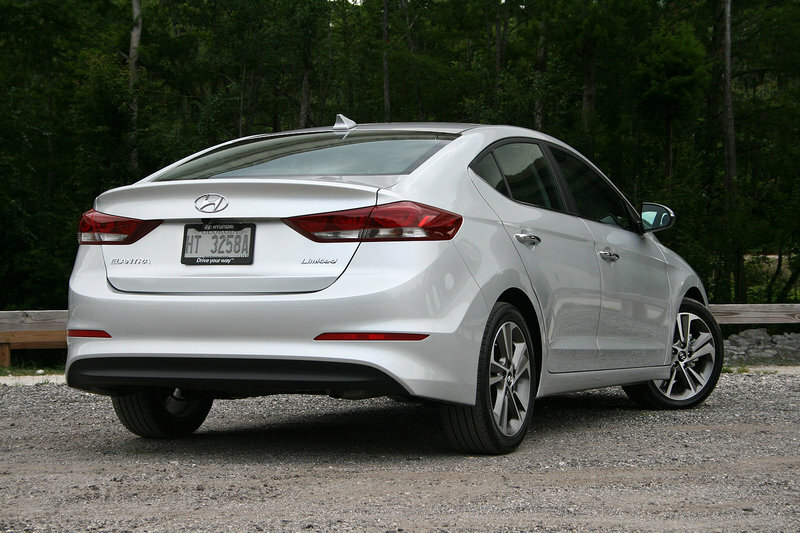 Equipped with the Limited trim, the Elantra carries a base price of $22,350. My tester came fitted with both the Tech Package and the Ultimate Package. For $2,500, the Tech Package adds navigation with the larger eight-inch screen, the Infinity audio system, the 4.2-inch color TFT driver information screen, a power sunroof, heated front and rear seats, and an auto dimming rearview mirror with HomeLink and compass. 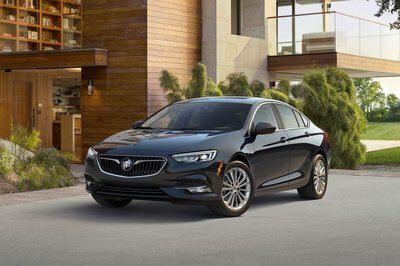 Atop that, the Ultimate Package costs $1,900 and adds HID headlights with Dynamic Bending Light, Automatic Emergency Braking with Pedestrian Detection, Smart Cruise Control, Lane Keep Assist, and Integrated Memory System for the Driver’s Seat and outside mirrors. A $125 set of carpeted floor mats and $835 worth of destination and delivery fees brought the total price to $27,710. The Elantra isn’t a sports car. There, I said it. It’s not built for lap times or 0-to-60 mph runs – no, this is built to be an honest sedan that’s easy to live with and practical for the modern family. 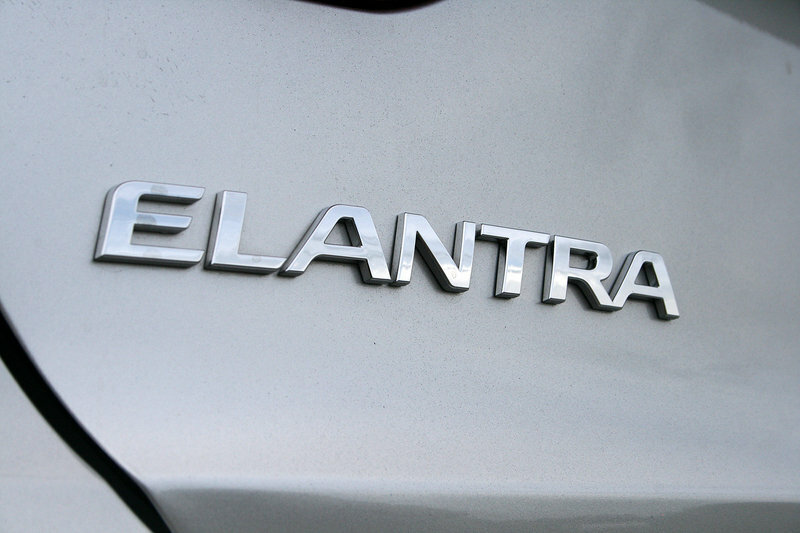 With that in mind, the Elantra is a respectable car from behind the wheel. The 2.0-liter gives it enough power to make driving enjoyable and highway passing possible. The extra sound deadening Hyundai packaged into the car for 2017 makes it far more tolerable on long drives, the seats are comfortable, the controls are easy to reach and use, and the additional driver assistance features give an extra layer of confidence. Now, when it comes time to traverse the mountain pass or canyon road, the Elantra’s steering is mostly communicative, allowing you to feel what the car is doing with relatively little on-center play. The throttle and brake pedals are easy to modulate. The throttle becomes more playful in Sport mode, allowing the engine’s power to be more easily accessible. Shifts happen smoothly yet quickly, especially in Sport mode. All told, the 2017 Elantra is a good driving car. You won’t mistake it for a sports car, though, and that’s fine. That’s not its purpose. One of the biggest stalwarts in the compact sedan segment comes, unsurprisingly, from Toyota. 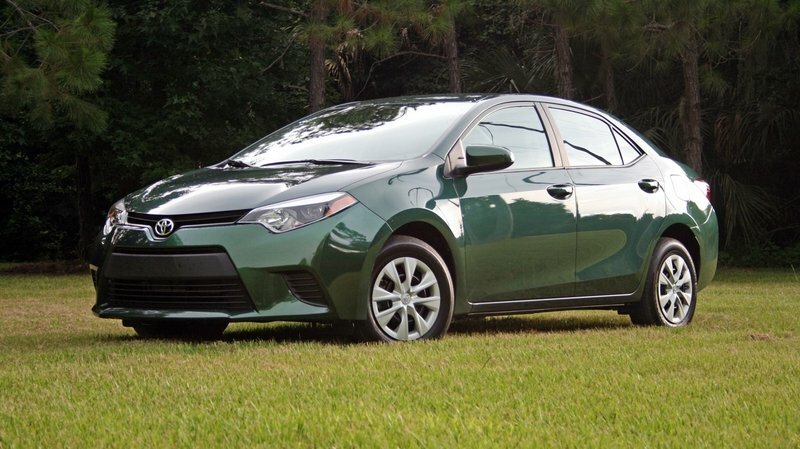 The Corolla has been a favorite among buyers since the 1980s and continues to be popular. The latest Corolla got its last major overhaul for 2014, so it is a bit on the older side. That’s evident by the lack of convenience and driver aid features found on the Elantra. Comparatively, the Corolla feels like mere transpiration and a viable ride for those who desire a car. The Toyota comes powered by a 1.8-liter four-cylinder mated to either a CVT or six-speed manual transmission. Even with the manual, many condemn the Corolla as a dull car to drive. 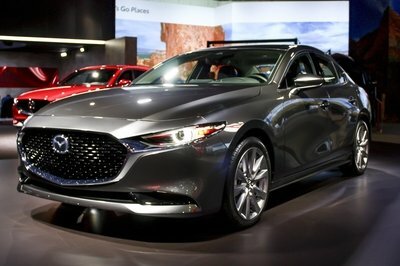 Those looking for a driver’s car should check out the Mazda 3. Still, the Corolla posts respectable fuel economy numbers. The EPA rates it at 28 mpg in the city and 37 mpg on the highway with the manual. Nevertheless, the Corolla represents a decent value. Prices start in the $18,000 range and crest in the mid $20,000 range. Read our full review on the Toyota Corolla here. More like the Elantra than the Corolla, the Chevrolet Cruze is a far more tech-savvy sedan with modern looks. That’s because the Cruze underwent an extensive refresh for 2016, making it a handsome contender. It shares a similar design language with the Volt, giving it a high-tech feel. 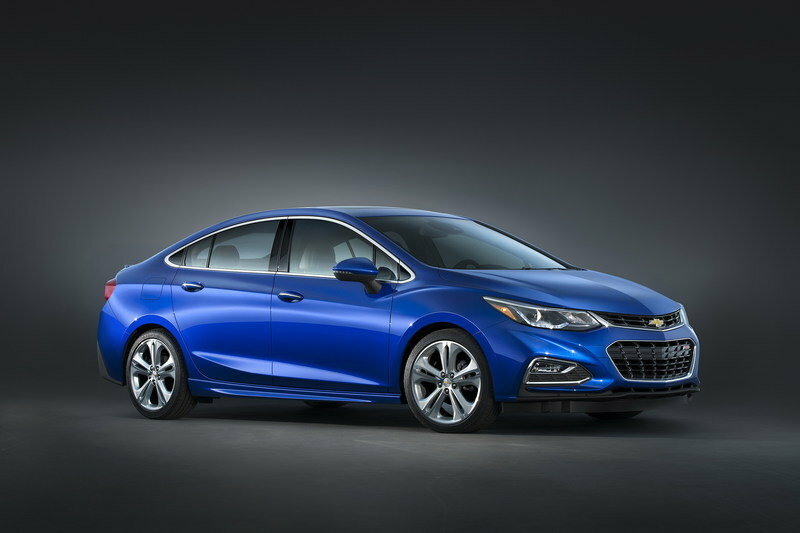 The Cruze comes powered by a 1.4-liter turbo four that’s all-new for 2016. 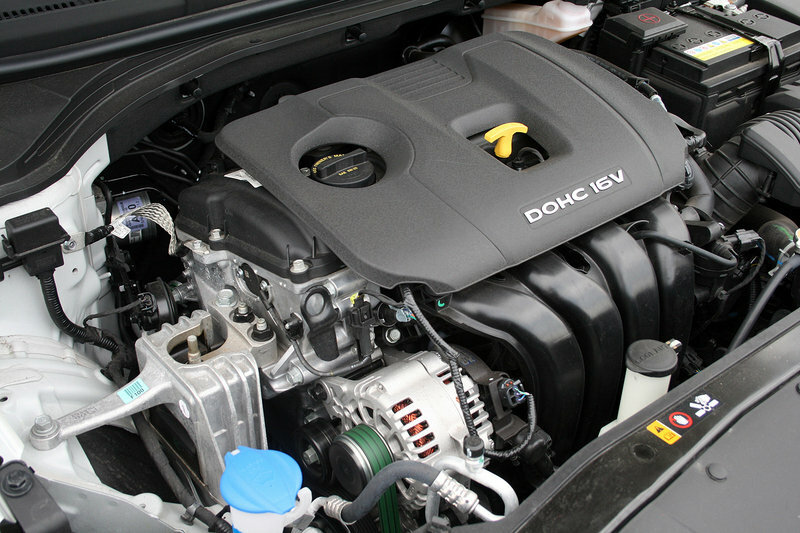 This new engine is all aluminum, making it lighter than the old iron-block 1.4-liter. The engine is also more powerful, boasting 153 horsepower and 177 pound-feet of torque. Fuel economy is also up, with the EPA rating the auto-equipped Cruze at 30 mpg in the city and 42 mpg on the highway. Prices for the Chevy start at $17,000 and top out around $25,000. Read our full review on the Chevrolet Cruze here. 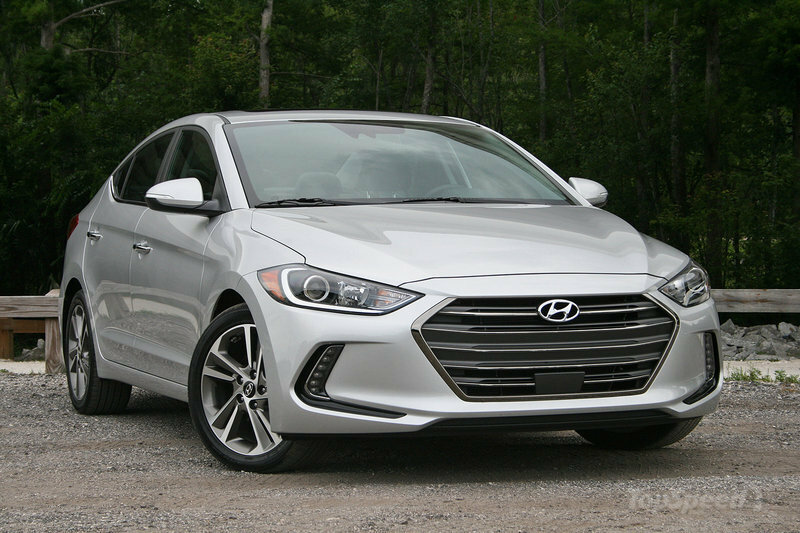 Hyundai’s efforts to propel the Elantra into the upper-market while keeping its size and cost in the compact category have paid off. The sixth generation car is leaps ahead of the fifth generation Elantra and light years ahead of anything Hyundai made a decade ago. The Elantra offers plenty of options and driver assistance features not normally found at this price range, while wrapping everything in a handsome package. There are a few low-cost items in the interior reminding me of the price, but otherwise, the car does an impressive job at fooling its onlookers into thinking its more premium than it is. All told, the Elantra is good to drive but ever better to live with. Its practicality and value are its two best features. And, that’s saying a lot considering its pretty face. For those in the market for a compact sedan, it would be hard to find a better package than the 2017 Elantra.